Students pitch their idea at Wheaton’s MassChallenge event. Wheaton has formed a new partnership with MassChallenge, the world’s largest startup accelerator, to create project- and internship-based learning opportunities for the college’s students while providing talent to promising new businesses. WIN at Mass Challenge, which stands for Wheaton Innovates at MassChallenge, is the name of the new program. It builds upon the college’s focus on putting learning into action through internships and its growing emphasis on “maker culture”, the creative industries and entrepreneurial activity, which are encouraged through the WHALE (Wheaton Autonomous Learning Environment) Lab and IMAGINE, short for InterMedia Arts Group Innovation Network. Wheaton students will contribute their energy and expertise to MassChallenge startups as they provide project-based and internship-based support in a variety of areas, including social media management, marketing, design, film production, and application and web development. Hannah Goldberg Professor of Teaching Innovation Josh Stenger is serving as the college’s liaison to MassChallenge, identifying opportunities for collaboration and mutual benefit. John Valentine, the director of partnerships at MassChallenge Boston, described the partnership with Wheaton College as innovative. “We have had partnerships and sponsorships with colleges and universities before, but this is unique,” Valentine said. “We are incredibly proud to be launching this program that we see as a model that we can use with other universities and colleges. “This has a special place in my heart because I truly feel the opportunity that we will be creating for students in the next year will be life-changing,” he said. 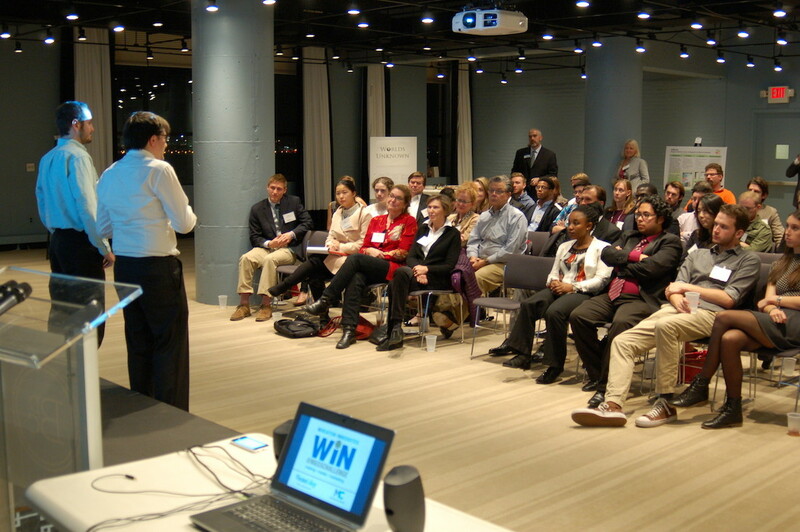 Wheaton and MassChallenge celebrated their partnership with a special event at the startup accelerator’s Boston location on Monday, Nov. 9, 2015. Before a crowd of alumnae/i, parents and friends, nine students pitched six ideas for new businesses and non-profit operations. The concepts ranged from an online service that would facilitate the sale of used textbooks among college students to an initiative to share Western advances in prosthetics with countries in Africa. The audience voted to select the winning proposal—an emergency management service employing drone technology—earning the student a stipend to attend an entrepreneurship conference of their choosing, courtesy of the college’s Career Services at the Filene Center.